This long-established surname is topographical and Olde English pre 7th century, at least in its origins. It derives from residence by an area of land made suitable for agriculture. The development is from the word "aecer", and this describes a ploughed field, although by the Middle Ages this had transposed to 'acker or acre'. In general topographical surnames were among the earliest created, since both natural and man-made features in the landscape provided easily recognizable distinguishing names, but it is not clear why this category should include such an abstract item as 'an acre'. We can only suggest that perhaps the surrounding lands were predominantly for grazing or were perhaps forest. Be that as it may the first recordings include such as examples as Bartholomew de Acre, also recorded as Bartholomew de Akers, who was bailiff of Norwich in the year 1282, and Adam de Acres, who is recorded in the London Calendar of Letter Books, dated 1346. Johannes Acrys and Roger Acres, seemingly patronymic spellings, are recorded in the 1379 Yorkshire Poll Tax Returns . 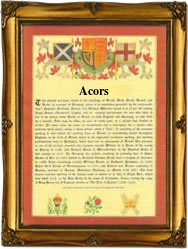 The surname now has several spellings, all quite rare, and these range from Acres, Ackers and Acors, to Akess and Hacker!. Examples of the surname recording taken from church registers include George Ackers and Jane Raynforth, married at Farnworth near Prescot, Lancashire on May 25th 1579, and Joanna Ackers, who married James Crafts at St Mary-le-Bone, London, on May 11th 1676. A Coat of Arms granted to the Ackers family has the blazon of a silver shield, charged with three gold acorns, husked green, on a black bend. The Crest being a dove rising proper, in its beak an acorn . The first recorded spelling of the family name is shown to be that of William del Acr', which was dated 1214, in the "Curia Regis Rolls of Sussex", during the reign of King John, known as "Lackland", 1199 - 1216. Surnames became necessary when governments introduced personal taxation. In England this was known as Poll Tax. Throughout the centuries, surnames in every country have continued to "develop" often leading to astonishing variants of the original spelling.